The new Model 346 non-browning lens from Resolve Optics Ltd. has been designed to operate with colour sensors in areas subject to radiation. Only in recent years have colour CMOS sensors been developed that can withstand the effects of radiation to any level that could be used in the inspection of radioactive sites. These sensors are still not as radiation hard as a tube camera but they can now withstand enough radiation to enable them to be used in areas of low and mid-range radiation levels. However for any camera lens to survive even quite low levels of radiation, without degradation, they should be produced from non-browning cerium-doped glass. Unfortunately most non-browning glasses are yellow tinted which gives colour images acquired by CMOS cameras a yellow appearance. To provide a solution to this problem, the Resolve Optics Model 346 lens was designed to utilise specially selected glasses with the least amount of yellow tint so that the image would be as natural as possible while still retaining non-browning performance in environments subject to radiation. The Model 346 lens uses special glass that can withstand long-term exposure to radiation up to a dose of 100 million radians and temperatures to 55°C without discoloration. Operating up to f / 2 it provides high image resolution and minimum geometric distortion from 400 to 750 nm, and it can image objects from 50 mm to infinity without using add-on adapters. 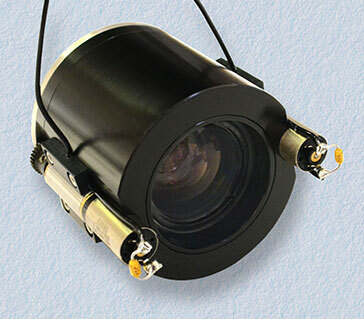 The Model 346 lens is designed for optimised use with 15mm diagonal colour CMOS sensors. For further information on the Model 346 please contact Resolve Optics Ltd. on +44-1494-777100 / sales@resolveoptics.com.